WHAT I SMELL: Sotto la Luna GARDENIA’s opening is green and slightly sharp along with being big and bold with a semi-vintage vibe. The initial opening is met quickly with a gourmand sweetness like almond extrait that’s layered under a spiced rose. And soon enough a creaminess develops that helps to radiate this incredible floral warmth as the notes begin to bounce around like a symphony of full-bodied petals. How can you not love a big, bold floral like this? Sotto la Luna GARDENIA is sweet with its gourmand almond and vanilla, but there’s a depth that keeps it from becoming saccharine as the sandalwood and tonka keep it leveled. 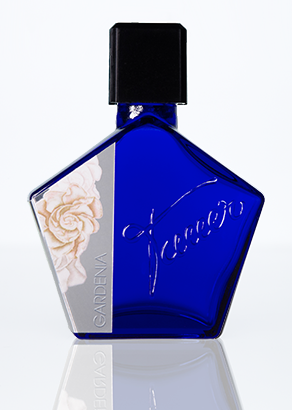 As Sotto la Luna GARDENIA continues to develop, it deepens and the florals project off the skin like they’re about to burst. The sweetness then begins to dissipate to be taken over by a more earthy component, like the heavy flowers are being plucked from the ground. At this point, the fragrance is heady, intoxicating and dreamy. After some more time, the florals retreat and the vanilla comes to the forefront and it’s creamy, lush and it swirls off the skin. After about an hour, Sotto la Luna GARDENIA begins to settle and calm. At this point the drydown is DIVINE, as it’s smooth, warm, lightly almond sugared and lightly powdered. In the end Sotto la Luna GARDENIA is incredibly comforting; so much so that it makes me want to purr like a kitten! Sotto la Luna®, inspired by white flowers blooming under the moon. Head Notes: The spicy freshness of gardenia budding under a bright moon. Heart Notes: The green floral delicacy of gardenia in full bloom with a gentle rose. Body Notes: The powdery mossiness of ripe gardenia with a hint of jasmine, in a bed of sandalwood, tonka and vanilla. WHAT OTHERS ARE SAYING ABOUT SOTTO LA LUNA GARDENIA: Is it possible that there aren’t any reviews of this yet? Categories: Tauer Perfumes | Tags: 4 bones, EDP, floral, fragrance, New Release, parfum, Perfume, review, Sotto la Luna GARDENIA, Tauer Perfumes | Permalink. I tend to dislike Tauer perfumes even though I like them in theory: could this be the one to change me? I really think you would love it. Tauer perfumes can go either way for me. This was not love at first sniff…but for some reason, the 2nd sniff sent me over the top. I hope you have a chance to check it out. I would love to hear your impressions. I do love me an intoxicating white floral! I’ve got a 5ml split of this coming as soon as it releases. Tauers either tend to really work for me or really not, and there’s no way to tell beforehand. Just gotta try ’em. 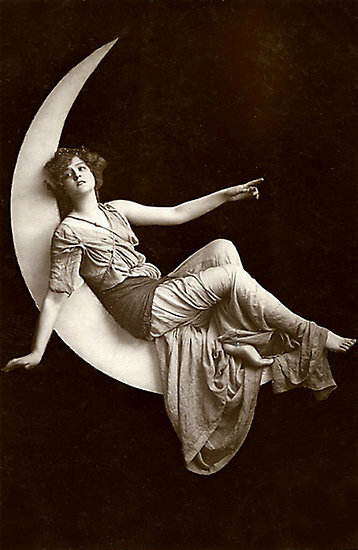 “Riding a crescent moon” sounds so fabulous – love that phrase! How did Daisy get a sample of this? I didn’t think they were available yet. (I don’t live anywhere I could just waltz into a brick-and-mortar store like LuckyScent or Twisted Lily.) In any case, that might be why nobody’s reviewed it yet. GLad to see this one. M – Samples are available online at Twisted Lily and other locations as of August 15th. I would check it out if I were you if you like your big florals. They’re may favorite and this falls nicely into that category. I have no idea why some visuals pop right into my mind, but it immediately went there when I put this on….I want to Ride a Crescent Moon too! I probably won’t bother with the sample since I’m expecting that decant (blind-bought)… just really looking forward to it now. I love a good blind buy…I hope you like it! Hound – indeed yes yours is the first review. Andy is holding back the traditional PR releases until September when Gardenia: sotto la luna is actually in store, so no samples have been sent out for review yet. As of August 15th samples are available from Tauerville USA shopkeepers LuckyScent, Tigerlily SF, MIN NY, Twisted Lily Brooklyn, Indigo Perfumery Cleveland, IndieScents Canada. Pre-orders also open now, the official on-counter launch date is September 9th, the night of the full-moon. And yes, it is DIVINE. Thanks Jeff – Count me lucky I guess. I got to be one of the first to experience a dream! I’m not into gardenia but this sounds fab Houndie! I’m looking forward to meeting Andy in person and trying Sotto La Luna Gardenia when I’m at Pitti in Florence next month. Wonderful to see a review, dear Houndy! This one is hard not to fall head over heels for! You know me so well. Thanks for the introduction my dear! As always, I’m very curious about a new perfume from Tauer Perfumes and will try it when I get a chance: I’m always hopeful that the new one will be among those few of Andy’s perfumes that work for me. Thanks U – This is truly growing on me. Every time I wear it I like it more and more. It is a little shy on the lasting power however. But that just means more spritzes! I am looking forward to trying this – despite Kafka’s polar opposite take on the scent, to put it mildly. The latest releases from Tauer Perfumes have been much more to my taste than the early ones, though saying that, I found myself enjoying Une Rose Vermeille very much the other day – in August to boot! Thanks for this ‘dreamy’ review – I love gardenia as a note, so this is a must sniff. Vanessa, I can’t wait to hear your thoughts on this. Although don’t expect that this is going to be “gardenia”..in fact, I get little to no Gardenia from the fragrance, but instead more gourmand floral.